Writing letters (or in today's world, sending an email) can be very powerful. Sending your thoughts to another person can serve many purposes. Sometimes we want to effect a change, sometimes we want to give feedback, and sometimes we just want to vent. I ordered a new pair of Crocs from Zappos. The pair I've used has been around for about four or five years. The toes are scuffed, but they have continued to serve their purpose - I wear them for gardening and house shoes - they are quick to slip into to take the dogs out first thing in the morning. A few weeks ago my Crocs disappeared. I looked in every closet. I live in a tiny house and I looked in every room. I had a memory of sitting somewhere to take them off and exchange them for the "real" shoes I was going to wear but for the life of me, I couldn't remember where I was sitting. I looked everywhere. I surmised either that I had left them by accident in the mountains a couple of weeks ago or that I had set them on an unlikely shelf that had not yet gotten my attention. I do love them even though when I went to the beach several years ago with my nephew, I asked him if I looked cool enough in my new sunglasses to go to the beach with him. "Well, Aunt Linda," he said in a matter of fact way, "The sunglasses are cool, but lose the Crocs." Now I have succeeded in losing the Crocs and despite their uncoolness, according to Avery, I miss them. So I went online to Zappos where I have ordered many a pair of shoes, found the basic navy Crocs I wanted, pushed the necessary buttons, shared the necessary PayPal information and ordered a new pair. The very next day, the Crocs were sitting on my doorstep when I arrived home. I opened the box to find that the Crocs waiting beneath the cardboard were not what I had ordered at all. They were Black and Grey rather than Navy and not only that, they were a different style of Croc as opposed to basic Crocs which I had wanted. Crocs Yukon sport in black/graphite. They fit and will serve the purpose - I only use crocs as hangout in the house shoes, but your robot picked up the wrong box in selecting my order. I've ordered from you many times and this is the first time I've been disappointed. I had seen a Wired article about the Bots that collect shoes on order from Zappos so I was amazed that I was the recipient of a failed "bot." They report almost no failures now that Kiva is serving their fulfillment needs. Thank You for contacting the Zappos.com Customer Loyalty Team. I hope this email finds you well! 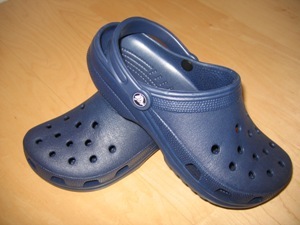 I am so sorry to hear you received the wrong color Crocs (not to mention the wrong style). Since I am not a big fan of disappointing our awesome customers such as yourself I am going to send you a free replacement pair of Crocs in the correct style that you originally ordered. Your new order for the Navy Classic Crocs will arrive on Wednesday. Don't worry, there is no need to return the original pair of Crocs, you can keep them as a backup pair. You were not charged for the replacement order, I simply transferred your funds over to the new one. To ensure you get the correct shoe this time, I have transmitted a message to our Warehouse-Bots to double check your order before it is shipped out. In the meantime, I have also upgraded your account to VIP! This is completely free and entitles you to next business day shipping, expedited returns, and other perks. Be on the lookout for a separate VIP email for more information! If you need any further assistance, please let us know! We are here 24/7 for the early birds, night owls, and everyone in-between. Have a great weekend! My email was intended to allow me to vent. I expected nothing else - but now I will have a navy pair of classic Crocs which was my original wish. And today my granddaughter found my old Crocs under a piece of furniture that was easier for her to look under at 2 1/2 than for me!